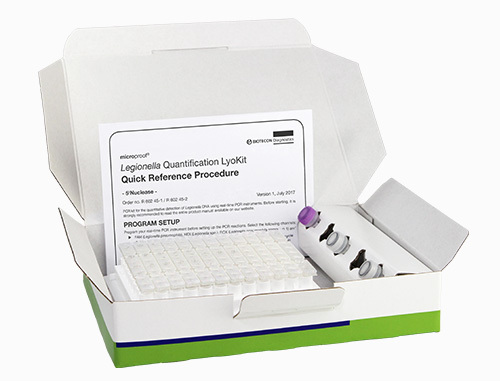 The microproof Legionella Quantification LyoKit can be used for the specific individual quantitative detection of Legionella spp., Legionella pneumophila and Legionella pneumophila serogroup 1. Legionella can be found worldwide in surface waters, soil and groundwater. Propagation occurs primarily intracellularly in amoebae and other waterborne protozoa. Legionella can therefore be found in many different natural and artificial water systems, e.g. in drinking water, in large plants for water heating, in evaporative cooling systems, cooling towers and wet separators. Even whirlpools or swimming pools with artificial waterfalls and fountains can be a source of infection. Under certain conditions (water temperature, pH, sediment, biofilm), legionella can proliferate and legionella-containing aerosols can be formed. The inhalation of these aerosols can result in mild febrile illnesses (Pontiac fever) or a potentially fatal severe pneumonia (Legionnaires’ disease). From cooling towers, legionella can be carried across several kilometers in aerosols and amoebic vesicles, which are resistant to environmental influences. Especially Legionella released from amoeba have an increased infectivity. Testing of water installations for the presence of Legionella spp. is therefore implemented worldwide in national guidelines, usually according to ISO standard methods for cultural and PCR detection. The Legionnaires’ disease is caused by Legionella pneumophila and constitutes a severe form of pulmonary inflammation, which is fatal in 15 to 20 % of cases. In Europe, approximately 70% of Legionella infections are caused by L. pneumophila serogroup 1, approx. 20% are caused by other serogroups, and 5–10% are caused by non-pneumophila species. These include Legionella longbeachae, Legionella micdadei (Tatlockia micdadei) and Legionella bozemanii (Fluoribacter bozemanae), amongst others. E.g. potting soil contaminated with Legionella longbeachae can be a source of infection.